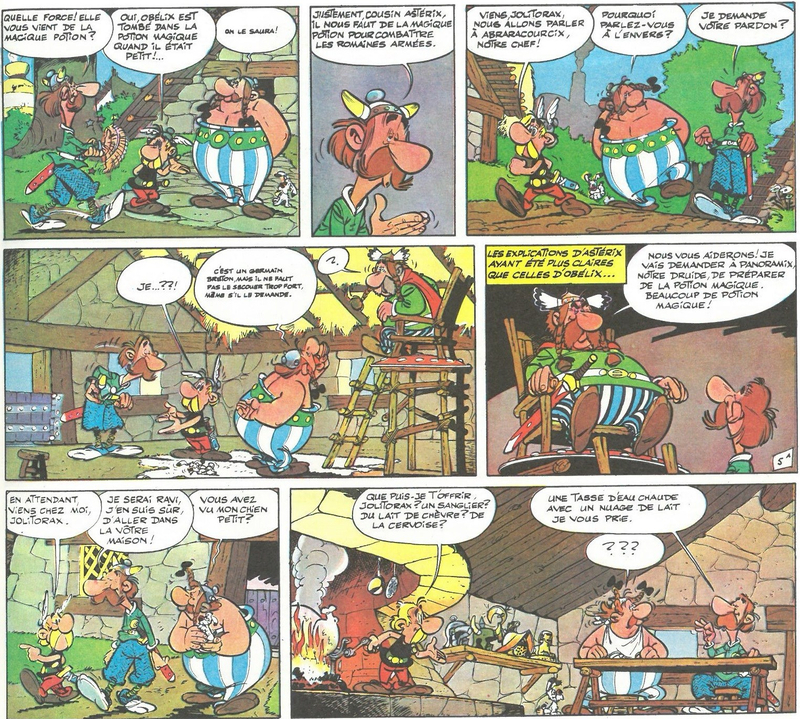 As promised in a previous blog entry, what follows is a discussion of the translation of some of my favourite Asterix gags. The translators’ modus operandi was to include as many jokes in the English translation as existed in the original French text, and on occasions, this task required a great deal of ingenuity on the part of the incomparable Bell and Hockridge. I’ve included scans of the original illustrations – I’m not sure where I stand as far as image copyright is concerned, but I’m happy to remove the pics if requested to do so. There are two references to Géricault’s painting here: (i) the chief speaks of having been ‘framed’, to mean ‘duped’ or ‘set up’, but the reference here is also to the physical frame of a painting, (ii) Jericho/Géricault: the ingenious translators have even managed to retain the joke based on phonological resemblance. The caption, ‘Ancient Gaulish artist’, alerts the reader unfamiliar with Géricault’s work to the parody of the painting. The words had to be completely changed in order to retain the joke, but the translated version entirely captures the spirit of the original. The joke in the French version centres on the word melon. In French, ‘melon’ means both the fruit and a bowler hat. A half-melon is similar in shape to a bowler hat, as you can see in the picture. 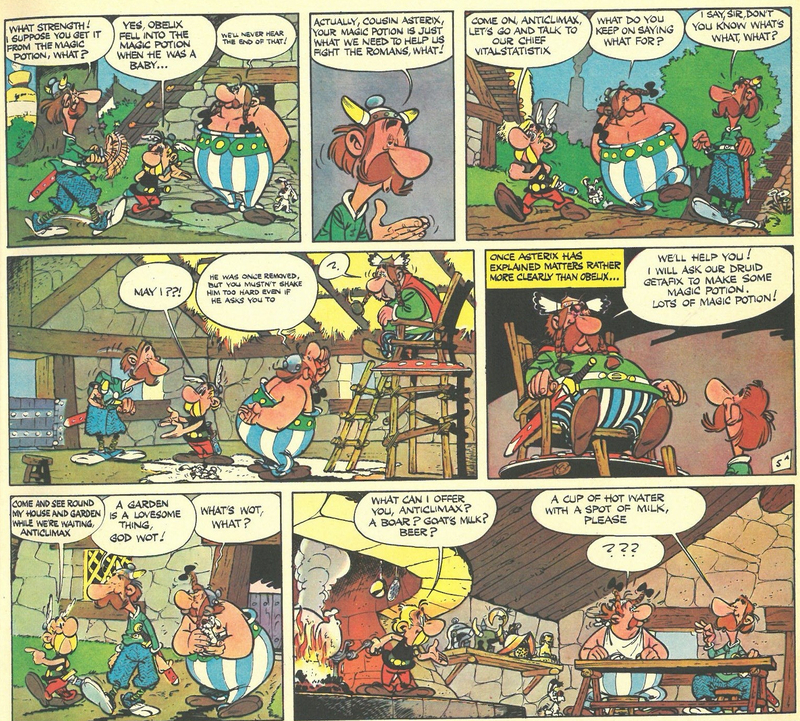 In this frame, the French are mocking the English way of dressing, or at least, the French idea of the English way of dressing: the chap to the left of the frame carries an umbrella, a fact which is discussed by Asterix and his English cousin; the grocer and his customer to the right of the frame are discussing the inflated price of a melon, thus adding the bowler hat to the umbrella, and – voilà! – we have an English businessman. Unfortunately, the tidy picture of the English businessman is lost. In addition, the coherency of the frame is also lost: in the French version, both sides of the frame work together to produce the joke (umbrella + bowler hat), but in the translated version, the man carrying the umbrella no longer has anything to do with the irate grocer and his customer. Nevertheless, ‘Rather, old fruit,’ still makes me laugh every time. i) Godwottery – not a word in common use! – means excessively elaborate speech or writing, especially regarding gardens. Hence the use of ‘lovesome’, noted in the COD as adj. literary, and therefore not a word commonly used in everyday speech. ii) God wot: ‘wot’ is an archaic form of ‘know’, so Anticlimax’s comment could be paraphrased as ‘God knows”. iii) ‘What’s wot, what?’: an echo of Anticlimax’s ‘what’s what, what?’ in the third frame at the top of the page. This is a joke which works on both a phonological level, because it is an echo, and on a graphological level: Obelix could not possibly hear Anticlimax’s alternative spelling of ‘wot’. It’s all very clever stuff, and certainly rewards the extra bit of investigation necessary to rootle out everything that’s going on here. This joke is both an elaborate pun and a visual gag. It works slightly better in English because the translators got a little bit more mileage out of it. 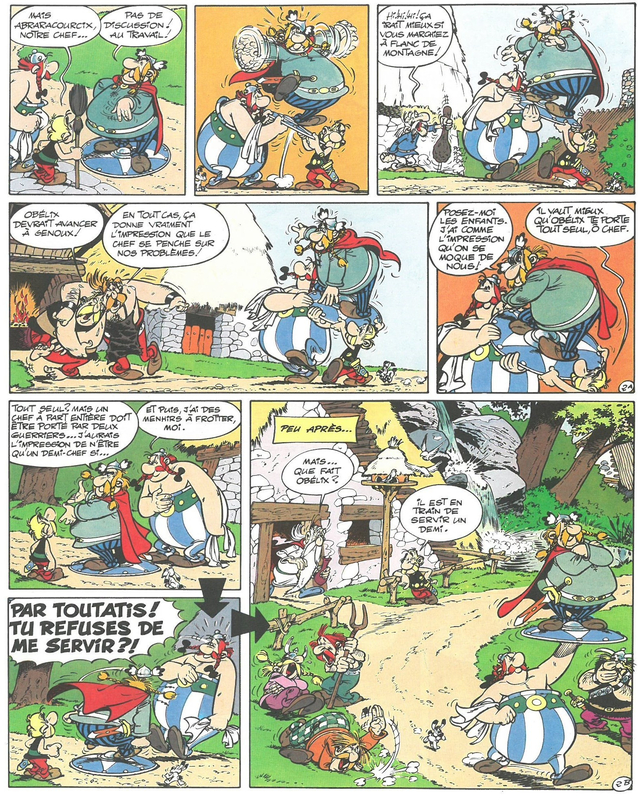 The visual gag is of course Obelix holding the chief aloft on his shield as a waiter would carry a tray of drinks, the most elegant touch being the cloth draped over Obelix’s arm: he was going to use this cloth to polish his menhirs but now the cloth completes the picture of Obelix as a waiter. Vitalstatistix, the half-pint of mild and bitter, retains an expression of nobility befitting a Gaulish chief, even though his subjects are quite literally rolling on the floor laughing. I love it. I love it all. I love it all now as much as I ever did. Very good post. You must blog more about the other jokes. I had a hearty laugh reading ” he is serving a half pint of mild and bitter”, and it is the middle of the night here, mind you. This is a great post! I’m a big fan of Asterix (in English 🙂 ) myself. It was also great to see Gericault’s painting discussed. One, he is again a favourite painter of mine; two, I once managed to be in the Asterix museum in Saarbrucken, where, among Goscinny’s original canvases of other classic and famous paintings, this one was there too. Really enjoyed reading. Can you help me? I have written a snail mail complimenting Ms Bell for the wonderful work she has done bringing Asterix comics to Enhlish speaking readers. For want of an address I am stymied and the letter stays in my drawer till date… Needless to say how much I appreciate your blog I came across online while surfing the net. I think Anthea Bell lives in Cambridge (UK), but beyond that I’m afraid I can’t help you with her address. If you send your letter c/o the publishers, I’m sure they will send it on. 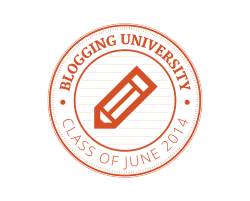 Good luck, and thank you for reading my blog! I think the explanation for the second joke is incomplete. In the french, it’s as though the customer and melon merchant are replying to the conversation about umbrellas. There’s no need to invoke an “english businessman” stereotype – one conversation extols the virtues of umbrellas for keeping things off one’s head, while the other reacts, “what, this [bowler hat] is too expensive?” [in contrast to an umbrella]. In the english translation, the melon comment is now incongruous, but the “rather old fruit” can be interpreted both as a slur directed at the guy carrying an umbrella, or a slur *or* reply to the melon merchant, turning it into a triple-entendre. Thank you for your comment, Darren. Yours is an interesting thought, but I think in the global context of the subject of this album – the visit to Britain – and in the localised context of Asterix’s question about native customs, the idea of poking fun at a stereotypical English businessman is a reading that still holds water. However, I do like the way that your interpretation, like mine, recognises the need to reconcile that which is depicted within the frame as a whole event, and not just a fragmented collection of happenings. Hello, thank you for your article. 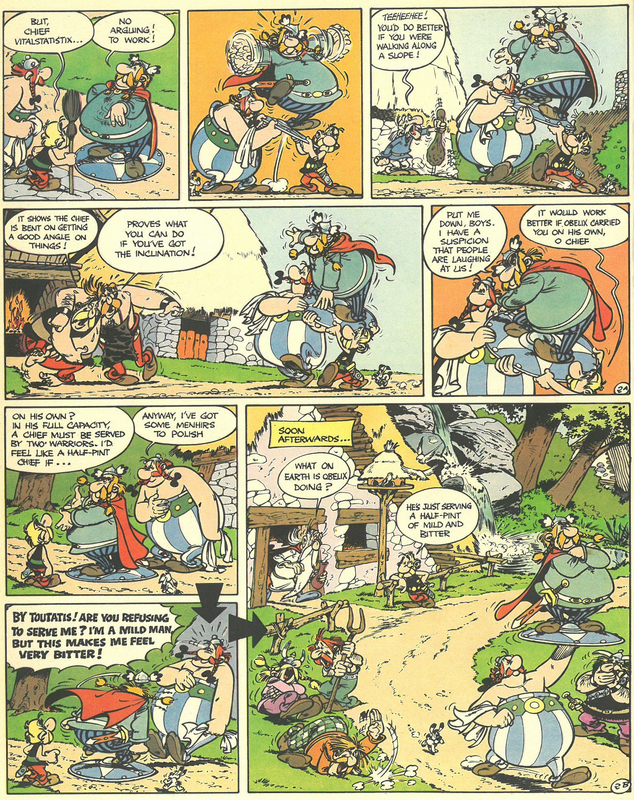 If I remember correctly, in the next panel, Obelix says something like “look, this man is wearing a melon”, which is how the pun is delivered in French. I now wonder how it was translated, I should probably go find an English version. Thanks! Oh yes, you’re right! In the next panel, Obelix’s comment (in English) is ‘I say Asterix, I think this bridge is falling down’, but in the French, he does indeed comment on a Londoner wearing a bowler hat (‘Tu as vu, Astérix? Ce Londinien est coiffé d’un melon!’). In which case, I’m definitely sticking to my reading of the English businessman stereotype. And yet again, we see how Anthea Bell freely adapted the text when there was no way to make it work in English. Hats (or melons) off to her. 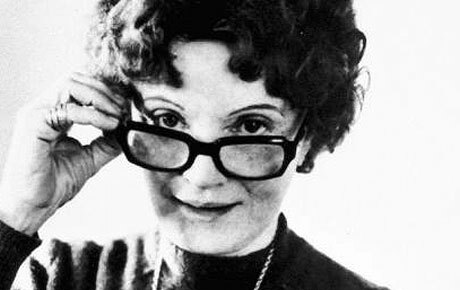 Her passing is a sad loss to the world of translation. This article is fascinating. The translations are so ingenious and creative. I’d like to add a comment for the The Godwottery joke. “A garden is a lovesome thing, God wot” is the first line of a 19th century poem by Thomas Edward Brown. Thank you, Clare. These translations just yield more and more all the time! Thanks for this wonderful post! Exploring connections between languages is one of my passions, especially when it concerns idiomatic expressions, or even better, pun. I had a great time reading this! Thread necromancy here; I’ve long been a *huge* fan of Astérix and have almost every album (save the last four, it’s been a while since I’ve been to Europe) and several in about 8 different languages. This is a wonderful post about a wonderful subject and a pair of masterful translators. I chuckled in “Astérix en Bretagne” where one sees souvenirs from previous adventures on the shelf, to wit: Astérix Légionnaire, Astérix chez les Goths, La Serpe d’Or, Astérix Gladiateur, and Astérix et Cléopatre. “Il est en train de servir un demi” always made me laugh hard, the originals are pricless. Thanks for a great read!